Former Scottish Liberal Democrats leader criticises Deputy Prime Minister's decision to back rises in tuition fees. 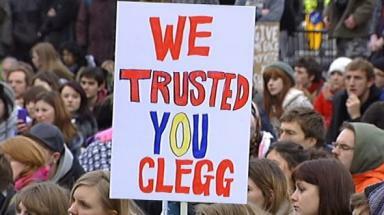 The Scottish Liberal Democrats were "dragged into the political gutter" by Deputy Prime Minister Nick Clegg's decision to back rises in tuition fees, former Scottish leader Tavish Scott has said. Mr Scott said on the first day of the Lib Dems' Autumn conference that he had "feared the electoral consequences of the decision" as the Scottish elections approached. Mr Clegg backed plans to increase the cap on fees last year after his party joined the coalition government in Westminster, despite an election pledge to abolish them. Mr Scott quit as party leader at Holyrood following the loss of 11 seats at the elections in May. His party returned just five MSPs to the Scottish Parliament. Writing in The Scotsman newspaper on Saturday in the first of a series of three articles, he said: "Kristy Williams, my opposite number in Wales, and I conference-called with Nick and said what would happen if the party reneged on its election promise. "We both feared the electoral consequences and for the same reason. "Despite protestations to the contrary from BBC Scotland and STV, the average Scots voter's perspective on politics is massively influenced by "big" news. "The national 10pm bulletins punch serious holes in Scots' understanding of what's devolved and reserved. "So despite having an impeccable record on abolishing tuition fees in Scotland - fees imposed by the first Blair government - Scottish Lib Dems were dragged into the political gutter by the decision in London." Mr Scott said he had often considered declaring independence from the Lib Dems at Westminster following the coalition, and had discussed the strategy with "valued political friends". He added: "My parliamentary group in Edinburgh were deeply unhappy about the London coalition." He also said SNP leader Alex Salmond had made "desperate efforts" to be involved in coalition talks following the general election result in 2010. "Salmond wanted to prop up Brown in Number 10 despite Labour losing the election. It took opportunism, even Nationalist opportunism, to a new level."